The Mark Degree is a fascinating degree and is rightly known as the Friendly Degree; it was originally worked in Craft Lodges and consisted of two ceremonies. 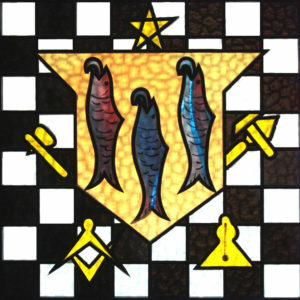 The first came after the Fellowcraft Degree where the candidate was ‘made’ a Mark Man, and the second after the Master Mason’s Degree when he was advanced to the Degree of Mark Master Mason. In 1856 English Mark Masons established their own Grand Mark Lodge and the two Mark ceremonies were combined into one. Since then it has been conferred, not in Craft Lodges, but in Mark Lodges consecrated for that purpose. The ritual explores the building of King Solomon’s Temple and, like all other Masonic Orders, the teaching of the Mark degree greatly adds to the knowledge and enjoyment of Masonry and links to other orders in Masonry, Royal Ark Mariners, Royal & Select (Cryptic) & Allied. 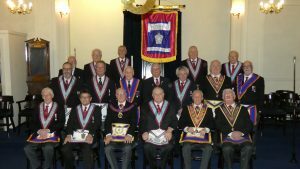 Prior Mark Master Mason’s Lodge meets on the first Wednesday of March, October and December plus the third Wednesday in June with their installation meeting taking place in March. 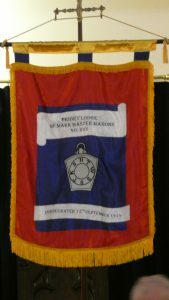 On Wednesday, 5 December 2018 Priory Mark Master Masons’ Lodge had their first-ever Lodge Banner dedicated. The Dedication Ceremony was due to be performed by the Provincial Grand Master, R W Bro. Alexander Sillars McLaren but a serious road traffic accident caused severe delays such that the Assistant Provincial Grand Master W Bro. Gerald Noel Howard Young, P.G.J.D had to step in at the last minute. He was supported by numerous Officers of the Provincial Grand Lodge of East Lancashire. Due to the numbers attending the Dedication Meeting was held at the Masonic Hall in Clitheroe by dispensation. The Banner was donated by a regular visitor to Priory Mark Lodge in the form of W Bro Cyril Kennerly who unfortunately could not be present due to a stay in hospital. A report of the proceedings was to be given to him by the Lodge Almoner. A photograph of the Banner accompanies this article. 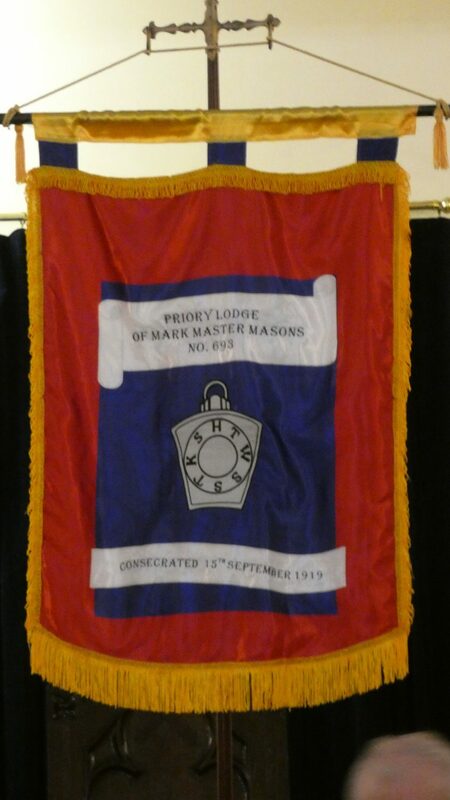 The Banner will be mounted in Priory Lodge’s usual meeting place of Whalley Masonic Hall (Lancashire’s Little Gem). A banquet was held afterwards at the Swan and Royal Hotel, Clitheroe (incidentally managed by a member of Keep Mark Lodge Number 911 meeting in Clitheroe). Some photographs from the evening can be found here.